Our most popular D-2 Tool Steel sleeve has been very successful in most molding applications including moderate concentrations of glass or mineral filled materials. One of the most wear resistant of the conventional tool steels, it is alloyed with 12% chromium and 1% vanadium which form very hard carbides. This high percentage of chromium gives it mild corrosion resisting properties in the hardened condition. 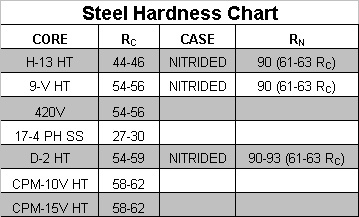 D-2 Tool Steel is thru-hardened to maximize its wear life. Crucible's CPM®-10V Tool Steel has proven itself for most difficult molding applications such as continuous use of glass, mineral, ceramic, calcium, & metal filled plastic materials. This extremely wear resistant tool steel is manufactured by the particle metallurgy process which makes it possible to alloy a high percentage (9.75%) of vanadium, which forms the hardest of the tool steel carbides. Crucible's CPM®-15V Tool Steel is the newest in the family of high vanadium, highly abrasion resistant CPM® tool steels. It contains 50% more hard vanadium carbides (14.5%) in its microstructure than CPM®-10V, to provide even higher wear resistance. CPM®-15V is intended for applications requiring exceptional wear resistance and where CPM®-10V is successful, but even longer life is desired. 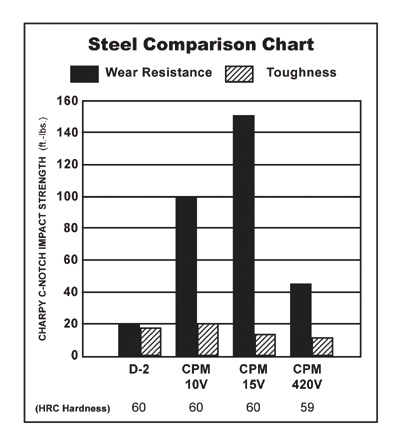 Crucible's CPM®-420V is a new stainless steel tool steel best suited for corrosion resistant applications. CPM®-420V is a higher performance upgrade for CPM®-440V. Corrosion resistance is significantly better than CPM®-440V, and wear resistance is about 25-50% better, due to the higher vanadium carbide content of the CPM®-420V (9% vanadium vs. 5.5-6% in CPM®-440V). We also repair bolt holes, threads, keyways, feed holes and ports. We specialize in super wear-resistant tool steel barrels, downsize/upsize conversions, and thermoplastic/thermoset conversions. We remove screws locked in barrels for a nominal fee. To help prevent loss during shipping, please attach a copy of your packing slip to the part itself, as well as the outside of the box. Services for Plastics, Inc. will hold parts sent in for inspection for a maximum period of six (6) months, after which the parts will be scrapped at our warehouse (unless prior arrangements have been made). Parts to be returned to you will be shipped freight collect. All incoming parts for rebuilding, repairs, etc. must be shipped to SFP "Freight Prepaid" in a strong, reusable container (see examples below). 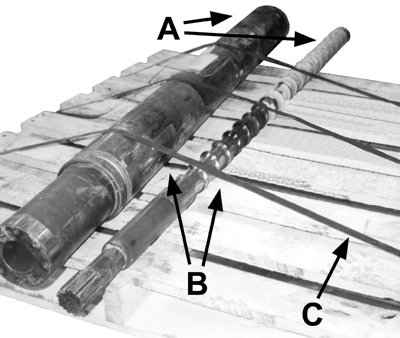 The Bill-of-Lading should be marked: MACHINERY PARTS, STEEL, CLASS 85, FREIGHT PREPAID. Smaller items weighing 70 pounds or less should be shipped via UPS Prepaid. In the event that items are received "Freight Collect", our Receiving Department must obtain approval prior to accepting the shipment. If the shipment is accepted, you will be billed for the freight plus a $35.00 Processing Fee. SFP reserves the right to refuse the shipment. Terms for Freight Charges: Net 10 Days. A copy of the original freight bill will be sent with the invoice. If parts are received in a non-reusable container, SFP will build a crate to return the repaired parts, and the customer will be billed for the cost of the crate. Double secured with nails and banding. Built for moving with a fork truck. Parts hanging unsupported over edge of skid; potential damage. No supports to prevent parts from rolling into each other; potential damage. Banding not strong enough to hold parts immobile; potential loss of parts. Copyright 1997-2018 Services For Plastics, Inc. All rights reserved.